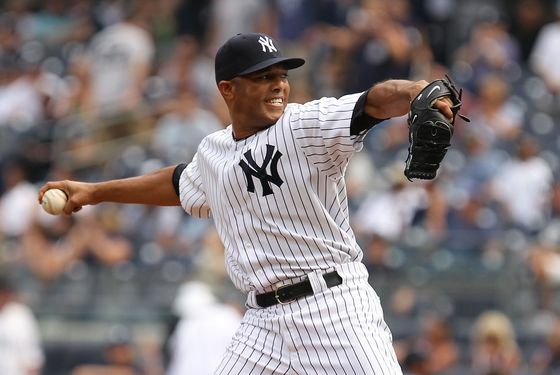 Mariano Rivera earned a save in today's 6–5 Yankees win. But that doesn't mean his rough week is getting any better. Let's set the stage from this afternoon's game: The Yankees took a 6–2 lead into the ninth, thanks to Robinson Cano's tie-breaking seventh-inning grand slam — one that followed a two-out error by Maicer Izturis. Corey Wade struck out Vernon Wells to open the ninth, but allowed a single and a double to put runners on second and third. And so with the tying run on deck, it became a save situation, meaning Joe Girardi called on Mariano Rivera to get the final two outs. But before you could say "all time adjusted-ERA leader," Russell Branyan deposited Rivera's first pitch into the right-center field seats. He'd retire the next two batters to record his 30th save — that's fourteen straight seasons with at least 30 saves, tying Trevor Hoffman's record — but it was just the third time he's allowed home runs in consecutive relief appearances. Like we said yesterday, this isn't the first time in Rivera's career that's he's gone through a rough stretch, and there are few players who deserve more slack, even at 41-years-old, before everyone should start panicking. But it doesnt make things like Marco Scutaro's double off the Green Monster, or Bobby Abreu's home run, or Branyan's homer today, any easier to watch. Having said all that, the Yankees won the game, and the series, and moved eight games ahead of the Angels in the Wild Card standings. (The idle Rays, meanwhile, are a half-game behind the Angels in third.) Via Jack Curry, if the Yankees maintain their .612 winning percentage, the Angels would have to go 36–8 to pass them. And at least Rivera did show off his A-stuff later on in the afternoon. Granted it was with a Wiffle ball at the Yankees team picnic, and the batters were Rafael Soriano's kids, but considering how the past week has gone, we'll take what we can get.